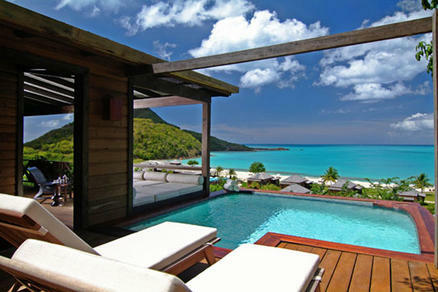 Hermitage Bay Resort, Antigua 5.0 out of 5 based on ratings. 6 user reviews. Hermitage Bay Antigua - One of Unforgettable Honeymoons top Antigua Honeymoon recommendations for couples who are seeking the utmost in privacy, and luxury! Hermitage Bay is an all inclusive resort- all of your meals, drinks and tips are included! You'll feel like you are in Tahiti or Fiji, the Hermitage Bay Bungalows are exotic and luxurious. You will be smitten upon arrival at Hermitage Bay it is beautifully Hidden away on a pristine white sandy bay on the west coast of Antigua, this 5 star luxury intimate resort has just 25 individual Cottages, some beachfront, and some on the hillside with their own private pools! Your sublime retreat might reside on the beach just steps from the water, or it may be tucked into the hillside with its own plunge pool. A casually elegant beachfront restaurant focuses on locally sourced ingredients, and a discreet, attentive staff tends to your every need. The Hermitage Bay Antigua is truly one of our favorite places in the Caribbean!